AS Apple prepares to open its first Adelaide store, some analysts say it’s being overtaken by competitors such as Google and Samsung. Is this the beginning of Apple's crumble? AFTER almost a year of speculation, Rundle Mall’s worst-kept secret has finally been confirmed – Apple is coming to Adelaide. The technology superbrand is set to open a new, two-level, $2.5 million store in Rundle Place Centre, the Pacific Group’s $385 million redevelopment of the Mall’s old Harris Scarfe block, after plans were this month approved by the City Council. Since April, when rumours about the company making a move here were first reported by the Sunday Mail, Apple has opened a new Australian store about every eight weeks. New storefronts in Queensland, New South Wales, Victoria and Western Australia, and the first to open in Canberra, have brought the number of Australian Apple stores to 18 in the past 10 months – part of more than 350 stores worldwide. and the meteoric rise in popularity of competitors such as Google and Samsung have some analysts predicting the superbrand is beginning to suffer from the absence of its late leader, creative genius Steve Jobs. 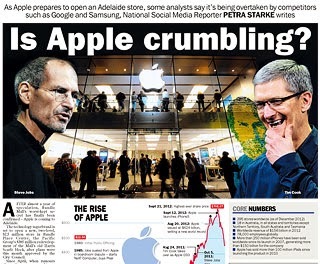 Are we starting to see the beginning of Apple’s crumble? months of 2012, but an increase in manufacturing costs meant a decrease in their notoriously high margins, which proved enough to spook the market. In other words, Apple sales may be up, but it’s bringing in less money per gadget. It’s precisely those gadgets that some analysts say need to be revamped to get the company back on track in the face of growing competition from rivals such as Samsung. In the past 12 months the South Korean manufacturer has emerged as a major player, not least because of its retail prices. Samsung’s array of relatively low-cost phones, which run on Google’s market-leading Android software, have made the company exceedingly popular with consumers for whom the comparably expensive iPhone is out of reach. The company has also led the trend for the ‘‘phablet’’ – phone/tablet hybrids with screens of between five and seven inches – that are predicted to be one of the hottest gadgets of 2013. Price would be almost irrelevant, some tech watchers say, if Apple would only release a product that excited people. up existing products. While the iPhone 5 and iPad Mini have proven popular, they’re hardly game-changers. The closest the company has come lately to replicating a Jobs-style breakthrough is its rumoured ‘‘iWatch’’, a wearable wristwatch-style smartphone reportedly in development. However, the company’s embarrassing ‘‘Apple Maps’’ bungle last year, which saw it release glitch-ridden software only to be beaten by Google, along with its decision to make the iPhone 5 incompatible with older cables and accessories, have arguably irreparably damaged the brand with many consumers. One in every five dollars spent on consumer technology in America last year went on Apple products, so it’s still the most valuable technology company in the world. But as more companies line up to take a bigger bite out of Apple, it remains to be seen how long it can stay that way.